Lemon water and honey – are suitable ingredients for making a cup of warm tea or a cold lemonade. Many fans of fast weight loss have turned their attention to the tonic drink of fresh lemon juice, maple syrup, water and cayenne pepper, which eliminates the feeling of hunger and promotes weight loss. Honey – an alternative ingredient to replace the maple syrup, which is not always possible to find and which is not liked by everyone. The main idea of this method of cleaning is to get rid of extra pounds by drinking of lemon juice, honey, water and pepper, which contain all the necessary nutrients for our body. That’s why it satisfies hunger. Such a diet – it’s part of the process for the removal of toxins from the body and getting rid of extra pounds. 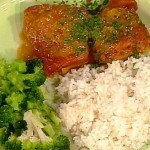 But some people have started to use this diet only as a way to lose weight. The theory is that the lemon juice contains most of the daily required nutrients, needed by humans. 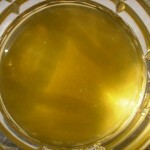 Syrup provides the necessary carbohydrates and other nutrients. A cayenne pepper not only adds spice, but also helps to cleanse the body and absorp vitamin B. Many people prefer to replace the maple syrup with honey. If you use a drink only to lose weight, this change will not change the low calorie and effectiveness for weight loss. Replacement of the normal diet with liquid diet, which consists of only a few ingredients, carries a risk to your health. While it can help to lose weight quickly, many doctors will tell you that this is not the healthiest way to lose weight. It is especially important to consult with your doctor before starting a diet, if you have any chronic diseases or other health problems. 1. Grate about 1 tablespoon of ginger root. 2. Cut off three rings of lemons. 3. Pound ginger, lemon and 2 tablespoons of honey. 4. Put ginger-lemon-honey mixture in a jar, add the tea leaves and pour boiling water. 5. Let stand for about 30 min., then drain through a sieve into a separate container. 6. Drink hot 4 times a day for half a liter. 1. Grate in a cup 1 tsp. of ginger root, add 1 slice of lemon and 2 tsp. of honey. Pound. 2. Add tea and pour boiling water. Done! This has three useful component. 1. Tea – the tea, whether green or black, is a tonic drink. Tannin – is a cause of this property. 2. Lemon – contains large amount of vitamin “C”. Vitamin “C” gives strong support to the body during colds. No less important is the essential oil contained in lemon. Lemon essential oil is known for its calming and relaxing effect. Additional useful effect is the effect of aromatherapy. 3. 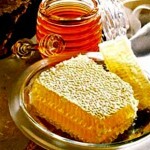 Honey – a storehouse of vitamins and various trace elements. 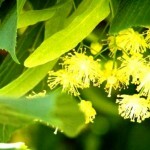 Honey can be used as a preventive measure, and in the treatment to strengthen the body. A tea with lemon and honey – it is 3 in 1. Lemon and honey do not like heat, because all the nutrients are destroyed. Therefore, you can not pour boiling water on the lemon and honey, or add them to the boiling water. Most optimal temperature for tea with lemon and honey is 40°C (104 F). This temperature allows the tea to be hot (but not scalding) and more comfortable to drink. Tea (black with lemon) – 2 tsp. 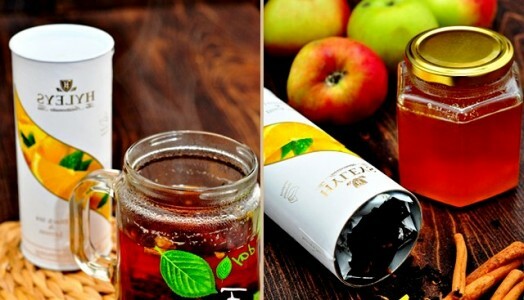 Apple juice (freshly squeezed) – 2 cup. Cinnamon (stick) – 1 pc. Water (boiling) – 2 cup. Squeeze 2 cups of apple juice. Pour apple juice in a saucepan, put the cinnamon stick and bring to a boil, simmer for about ten minutes on low heat, add the honey, turn the heat off. Boil 2 cups of water, put 2 tsp. of tea. Keep tea for four minutes, then strain through a sieve. 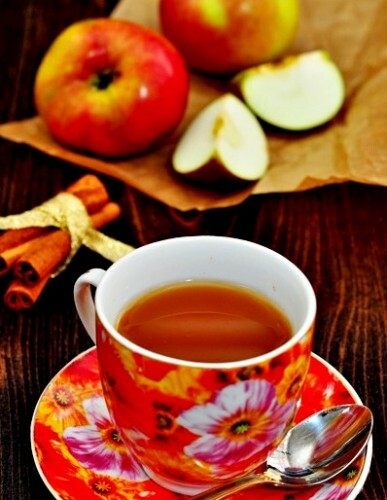 Pour apple and honey liquor mixed with tea into cups, and serve hot. Take 3 grams of black tea leaves, 0.5 cups of honey and 2 cups of water and the juice of one lemon. In the heated teapot put the dry tea and pour 0.5 liters of boiling water. Cover and infuse for 15 minutes. Sieve tea and add boiling water. When the tea has cooled slightly dilute honey. Add lemon juice and stir. Today, a person has almost no to sit down and take a breath. We work a lot, rest little. And completely forget about the health. Fortunately, even our grandfathers and grandmothers knew magic recipe, familiar to all of us since childhood – tea with lemon and honey. This wonderful drink cheers and gives strength for a productive working day. In the evening, green tea with lemon and honey helps to fall asleep quickly, and yo never have bothersome thoughts about the day. But, of course, the most unique – its amazing healing properties. 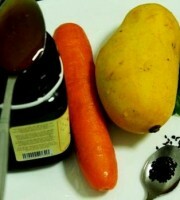 Each of the ingredients of this fragrant drink has beneficial effects on the body. We know a lot about the miraculous effect of tea. It speeds up the metabolic processes in the body is able to clean and make the blood vessels more elastic and thus to overcome the disease. Lemon has vitamin C. It is a pure product with a useful antiseptic. Lemon successfully fights bacteria and viruses, as a natural antibiotic. Lemon juice nourishes all body tissues and eventually strengthens immune system. The healing properties of honey are truly legendary. And almost all of them – are true. After all, what is honey? It is a storehouse of fructose, glucose, vitamins B1, B2, B6, E, K, and C. Each time you drink green tea with honey and lemon, remember that honey helps to strengthen the immune system, overcome stress, and has a tonic and restorative action. That’s why, if you feel the first symptoms of a cold, it is not necessarily to immediately run to the drugstore and grab a new, but not the most useful, development of pharmaceutical industry. Wrap up yourself in a warm blanket and make tea with lemon and honey. Feel that the disease recedes. By the way, take a note, that lemon tea with honey – a great way to prevent sore throats, runny nose, bronchitis, tracheitis, and heart disease. Wash 10 lemons and mince with the skins, add 1 kg of honey and 5 heads of minced garlic. Eat two times a day after meals and drink tea with hawthorn. Boil 1 lemon over low heat for 10 minutes. Cut it in half, squeeze out the juice. Drain the juice into a cup (200 g), add 2 tbsp. of glycerin. Stir and add honey to top. (Instead of a lemon, you can use apple cider vinegar). 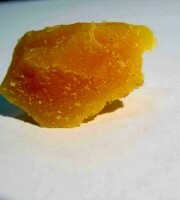 For the treatment of a sharp cough, take 1 tsp. during the day (before drinking the mixture is shaken). If the cough is at night, then you need to take 1 tsp. in the morning, getting out of bed, one before lunch, one in the evening, after dinner and before bedtime. After reduce the number of rounds. This treatment has several advantages. Do not harm the stomach, helps equally to both adults and children. It is effective even when other means do not help. 10 lemons, 6 eggs, 300 g of lime honey, 75 grams of cognac. Preparation: put well-washed eggs, whole and fresh in a jar (eggs should be always with white, not yellow shell). Squeeze lemons on eggs. Put in a cool, dry and dark place, but not in a cold, cover with gauze and wrap with dark paper. Keep to dissolve eggshell, about 5-8 days. 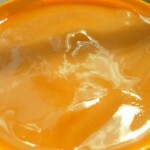 After this time, it is necessary to warm the honey to the state of flow, cool and pour it into the mix. Then pour the cognac. Pour medication into a dark jar or bottle and store in a cool, dark place. 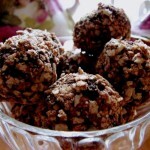 Take 1 dessert spoon, 3 times a day after meals. Note. For the treatment of lung disease it is advised to eat more fruits and fats. Sometimes a person, healthy and not susceptible to tuberculosis, has a rash on the body in the form of small pimples that are very itchy. The appearance of pimples – is very characteristic indicator of calcium deficiency in the body. This mixture cures everything in two days. Take 1 dessert spoon after meals three times a day. Regular tea may be a good treatment for sore throats, if you drink it with honey and add three slices of lemon. Tea should be very hot. It is recommended to use daily 80-120 g of honey with lemon juice and rosehips, which improves diuresis and reduces toxicity. 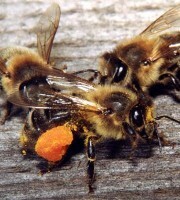 In the treatment of renal diseases honey is used with mineral water, better warm. 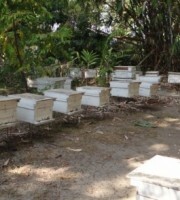 Honey can be used with pollen, propolis, royal jelly. Comprehensive treatment is highly effective. Take 1 tbsp. a day. The course of treatment – 3-4 weeks. To reduce the effects of intoxication and to improve the health, for the treatment of acute respiratory disease, we recommend the following recipe: boil 250 ml of strong tea, add 2 tsp. of honey, add 1 tsp. 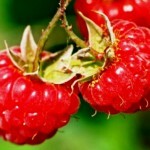 of raspberries and sea buckthorn, pureed with sugar and the juice of 1/3 lemon. Take the form of heat 3-4 times a day. Take 100 g of honey (preferably lime), squeeze the juice of 1 lemon and dissolve it in 800 ml of boiling water. Drink during the day. Take 1 liter of honey, 10 lemons and 5 heads (not cloves) of garlic. Wash lemons, peel, and then squeeze the juice from them. Peel garlic, rinse, mince and squeeze the juice. Combine juices with honey, mix well and put in the fridge for a week. Take 4 tsp. (one by one, slowly), 1 time per day for 1.5 – 2 months. Take 1 liter of honey, 10 lemons and 5 heads (not cloves) garlic. Squeeze of lemon juice. Peel garlic, rinse and mince. Mix all ingredients, put in a glass jar, close the lid and place in a cool place. A week later, the mixture can be taken 4 tsp. 1 time a day (after taking each tsp. make a break for 1 min.) for 20-30 minutes before eating.